I'm very excited to share my very first haul of the year, even if technically all these items were purchased during the last week of 2016. This is also my very first Lush haul! Monday, the day after Christmas Lush had their annual sale in which consisted of Bogo deals, buy one get one free on all their holiday items. I already had plans to head into my mall that same morning and when I got the email about the sale immediately I thought it was meant to be. I picked up a total of four gift sets during this sale and two full sized shower gels, I mean how could I not take advantage? If you are ever looking to buy from Lush this is definitely the best time to do so. 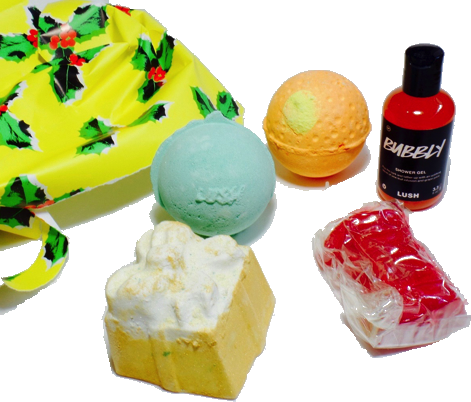 The gift boxes are filled with a variety of goodies and they mainly consisted of items that I've never tried apart from a bath bomb or two. Gift sets are such a great way to try out some products that you've never tried before. Let's begin! I made two separate trips to Lush in that week and during my first trip I picked up a full sized bottle of their famous Snow Fairy shower gel. I had never owned this wash nor had I ever tried any of their shower gels in the past. When they brought this back for the season I smelled it for the first time and I fell in love. I really wanted to receive this for Christmas but didn't, Santa had already brought me lots of other goodies. This shower gels smells of sweet sparkly candy and I don't find the sweetness of it to be too overwhelming or disgusting. Since the shower gel was apart of their Bogo the second gel I picked up is the Rose Jam shower gel. I've heard people talk about Ro's Argan body conditioner and when I found out about Rose Jam I knew it would be a shower gel I'd enjoy using. I love the smell of roses and that's exactly what this wash smells of. It's a floral heaven, I cannot wait to use it. I'm so excited to try out all these new-to me Lush items. The first holiday gift I picked up was the Sweet Christmas gift. This box came with three items which included the Twilight shower gel. This shower gel has a fragrance of lavender and sweet tonka that is perfect to use before bed. It's comforting herbal sent is said to drift you off into dreamland. 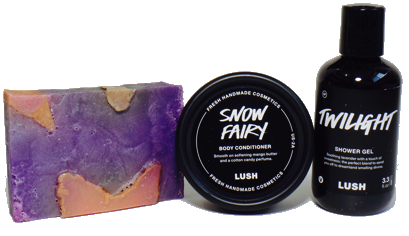 Second item in this set is the Snow Fairy body conditioner. This smells exactly like the Snow Fairy shower gel and are perfect to be paired together. This body conditioner is to be used in the shower after you've washed yourself like normal. Then massage this into your wet skin and rinse off. It'll leave your skin feeling soft while smelling like candy, yum. Now for the last product that was included was the Shooting Star soap bar. In the past I have had two small cubed sized samples of Lush's soap and although they smelled amazing I wasn't much of a fan. I think it was due to the small sample size it made it hard to work with and lather up. I had seen this soap online under Lush's new items and thought it looked beautiful. I was so happy that this soap was included in this gift and was so excited to try it. This bar is already in my bathroom and I have used it a few times. I've been loving it and its citrusy scent brings such a delight aroma into the bathroom after every use. Now for the second holiday gift I bought is the Christmas Party gift. 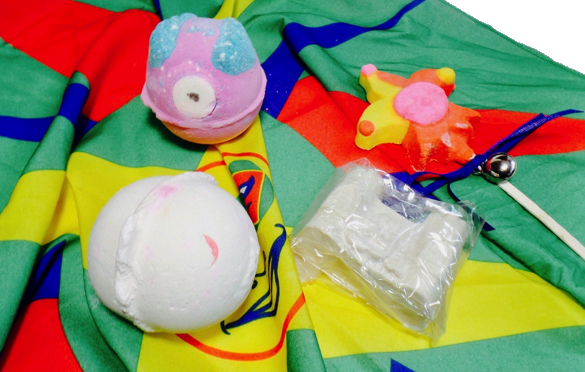 This set also came with three items and one of the items is the Never Mind The Ballistics bath bomb. I was very happy that a bath bomb was included in this gift. I wanted to purchase so many holiday bath bombs and never got a chance to. This bath bomb smells of wondrous citrus, I definitely love that most of their bath bombs and products smell so fresh and citrusy. This contains cocoa butter melt and bananas that will soften the skin. I am a huge fan of anything that will soften my skin especially in winter time. Yuzu And Cocoa shower cream is the second item that was included in this gift. The fragrance of this cream consists of citrus, cocoa and tonka. I've already been using this gel and I find the scent a little strange mainly because I've never smelled anything like it. I have been enjoying it and love how soft it leaves my skin feeling once I hop out of the shower. Lastly, another bar of Shooting Star soap was included in this set and I'm more than happy about that since Im loving it so much. My mind is content knowing I have a backup. 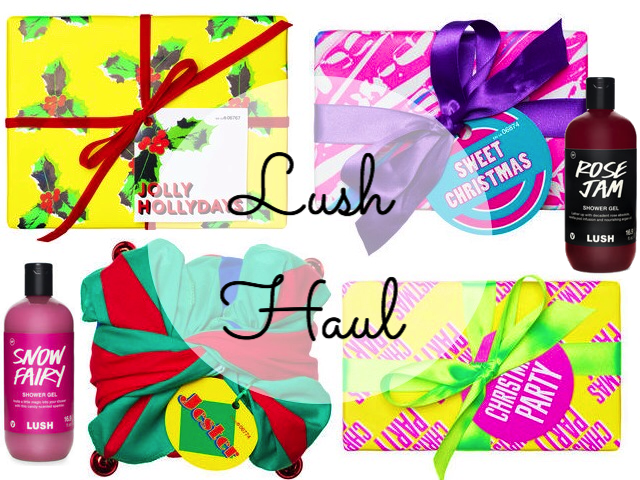 Later in the week Rudy and I made a trip to a different Lush store and I picked up two more holiday gift sets. The first was the Jester gift. I loved the packaging to this set because it was different from all the rest. This gift is wrapped in a bandana looking wrap with a Jesters face in the center. This gift included four items first being of course the Jester bubble bar. This wouldn't be a Jester gift set without this jolly joker. This bubble bar is packed of zesty tangerine and Sicilian mandarin oils and it will fill up your tub with bubbles. 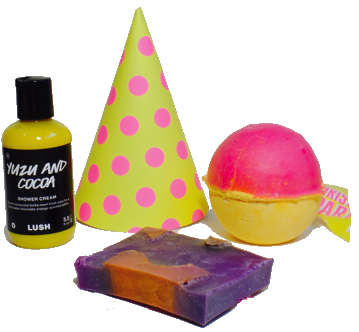 Fruity lime and neroli perfume is what Monsters' Ball bath bomb smells of. I believe this bath bomb was released while they had their Halloween products and I've heard nothing but great things of it. I'm excited to use this spooky cyclops soon! Dragon's Egg is a bath bomb I have already used in the past. This is definitely a fun one, while this bomb is fizzing away small surprises start to appear in your tub. If you haven't already noticed a theme this is yet another item in which contains a fresh and citrusy scent of lemon and bergamot. Definitely my ideal scents. To conclude this gift the last item found here is the Snowcastle soap bar. This soap is perfect for winter dry skin since it is made with soothing rose and benzoin resinoid. Its marzipan scent is said to be good enough to eat. Hmm, maybe I will be the judge of that. Last but not least, the final holiday gift I grabbed is the Jolly Holidays gift. This set is filled with even more wonderful goodies and came with five items. The first item I saw when I opened this up was the famous Golden Wonder bath bomb. This bath bomb is dazzling in wondrous golden glitter and smells of cognac, zesty lime and orange oils that is sure to uplift your day. Next is one that I'm already a fan of and its Avobath. This bath bomb is filled with avocados and olive oil to soften and moisturize your skin. The last bath bomb has a bursting blend of bergamot and Sicilian mandarin oils that gives off an uplifting orange scent. Satsuma is a bath bomb that can only be found in a small selection of gifts sets and I was told it is normally a UK exclusive! Santa's Postbox contains the design from UK's postboxes and is packed full of satsuma juice, enzyme and citrus essential oils to brighten your skin. The final item in both this gift and haul is the Bubbly shower gel. Fans of Golden Wonder bath bomb are said to recognize the perfume of this gel which is full of lime and Brazilian orange oils that guarantees to leave you feeling silky soft. Oh and lets not forget smelling fresh. I am definitely stocked up on shower gels, soaps and bath bombs! I'm looking forward to trying out all these items especially ones that I've never tried before. Everything smells so good I am even more excited for bath time and those pampering evenings. Have you tried any of the items that I shared above? What is your favorite Lush item that you would recommend? I've tried the Dragon's Egg before too but I regret not buying that Rose Jam, It sounds amazing! I really liked that Jolly Holidays gift set, it came with many awesome goodies. I'm happy I picked up the large size of Rose Jam and I can't wait to use it. These gifts came with so many goodies its been so hard to choose which to use first.